Long road trips and airplane rides with kids are never fun but the destination is usually worth it! 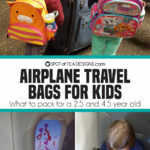 On a recent road trip from New Jersey to North Carolina, I packed the car with all sorts of activities, crafts and goodies to keep my 3 and 5 year olds entertained. Here’s what I packed, how I set up their seats and tips to make the trip as enjoyable as possible! I’m happy to report than while we did pack our Amazon Fire for this trip, we ended up not needing it for our car ride travels (as after 8 months of owning it, they still have never used it in the car!) Instead I filled their time with pointing things outside the car, singing and the below road trip activities! 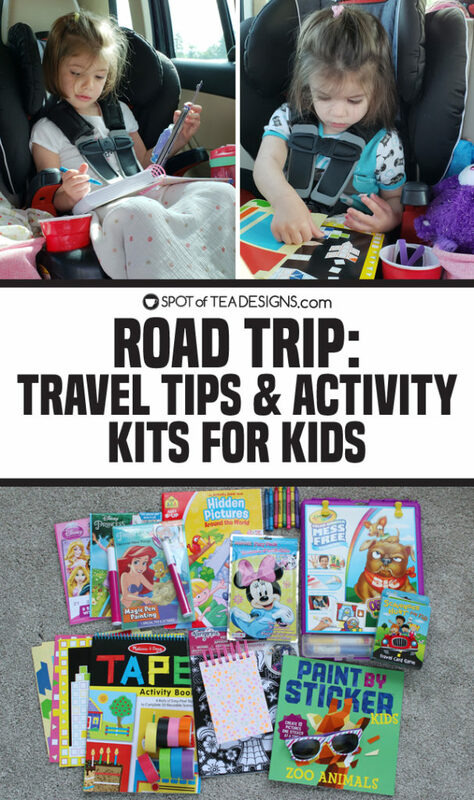 If you’re not planning a road trip soon, use this as a guide to add some items to your kids holiday wishlist or throw them in your Amazon cart asap! Some are small enough to fit in a stocking so it’s never too early to think ahead! Pack all your meals for the road so you only have to stop for potty breaks, gas and the occasional stretch of the legs. Plan to drive during one of their sleep sessions, preferably the first run! We left for our 8+ hour trip at 4am and within 45 of getting into the car they both settled down for a first nap. We ended up getting them both to nap again around noon! The ride home we didn’t leave until 6am so we only got the one nap in about 2 hours from home. Put a plastic cup in their car seat cup holder that can be used to corral smaller arts and crafts items, like crayons or mini markers so they aren’t being dropped on the floor. 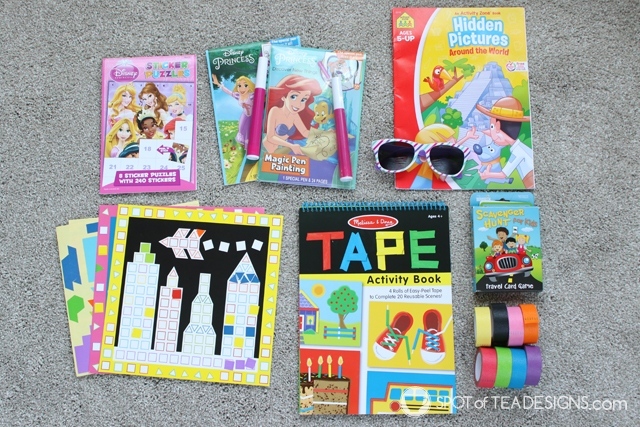 Visit the Target dollar spot, dollar store or dig through your hopefully hoarded collection of gifts you didn’t yet give to the kids and put together a bag of tricks and slowly gift them during the ride. Velvet Art Posters – Found these at Dollar Tree and they were the biggest hit on the ride down! Mostly, I think because I don’t normally let them play with markers so having a mini set of markers to color inside the lines was a lot of fun and they kept asking to have this again after I’d put it away. We ended up buying a second one for the car ride home and it was just as big of a hit! Mess Free Coloring Stow and Go Kit – This had been a gift from a previous holiday that I had tucked away for an occasion like this. Since Brielle, my oldest, got more involved activities and crafts, I kept this one just to Hailey. If you’re not familiar the special markers only write on the special sheets so there’s no worries about markers getting on their clothes or other things. 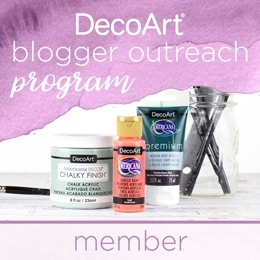 Play packs – These mini themed activity kids are usually reserved for eating out at a restaurant but I thought the $1 was well worth some activities in the car. They usually include a few crayons, coloring sheets and stickers. Sticker mosaic – Broke these out early and distracted them for a little bit. The colorful stickers are all different shapes and need to be placed on the mosaic to make a beautiful picture. Brielle, age 5, was more into it than Hailey but I’d still consider this one a win but some quiet in the car! Magic Pen Painting –A pen that magically colors in a scene to the exact color you’d want to see and it’s done in prints and designs that they already love? These are a no brainer for little kids! Hailey’s a big Ariel fan these days so this design was much loved! 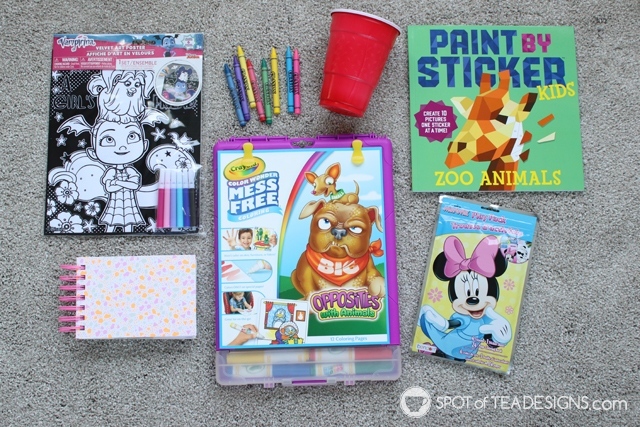 Paint by Sticker Puzzles – Brielle LOVED these from our previous airplane experience to Disney so I was happy to see she was gifted this Paint by sticker for kids and this sticker puzzle bundle pack for her birthday right before the trip. Both types were a hit! 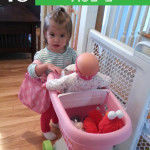 I actually gave Hailey one of the latter styles one afternoon at the house and she was able to complete it all her own! Hidden Pictures – If you have a kid that’s into hide and seek or I spy type activities, then this will be a winner! Give them a crayon or pencil and have them seek for each of the objects shown on the bottom of the page. 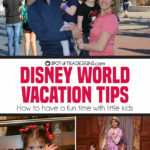 Tape Activity Book – Again a big hit from our Disney trip and one we brought out again for this trip. The good news is while the tape itself is a consumable item, the activity book isn’t so you can always just get more tape to keep them entertained! 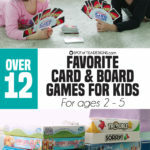 Scavenger Hunt for Kids card game – We didn’t break this out until the car ride home and it was a fun activity to get everyone in the car involved. The cards have common roadway sites on them so it’s fairly easy to spot. 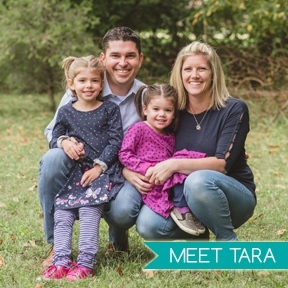 Some, like blue car, fence, stop sign, are easier for the kids to spot, whereas finding a license plate with a specific letter or a person walking a dog were a little more challenging.